No matter what avenue you take when creating your wedding invitations --- making your own, hiring a designer to create something from scratch, or choosing from preformatted yet customizable designs from an online invitation company like us --- you will need to consider whether or not you plan to include an response (or RSVP) card along with your invitation. Although it may seem like a simple choice, there are actually quite a few factors that must be considered. Sending postcards or paper response cards with stamped envelopes allows invitees to quickly respond and put the card in the mail. Recently, some brides and grooms have asked guests to RSVP via online forms or email. While these paperless may seem more convenient than sending another card with another envelope and paying for more postage, traditional paper response cards are actually very helpful for both parties. Why, you ask? It’s polite to send a formal, paper response card. Some guests will not have access to the Internet or feel comfortable replying virtually. Invitees can also use the pre-stamped and addressed postcard or envelope to send a gift along with their RSVP if they are unable to make it to the wedding itself. Response cards also help hosts know how many guests to expect, the number of party favors needed, how much and what type of food to prepare, who to include in seating charts, etc. 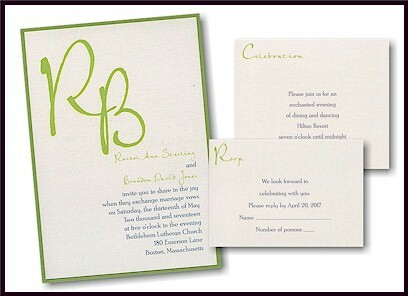 Because of the added convenience that paper RSVP cards offer, it’s best practice to follow tradition in this area of your wedding planning. Let’s take a look at what goes into creating a stellar RSVP card. First we must consider what information we want from our invitees. What entree will they be eating? Are there any food allergies we need to know about? How many guests will attend? 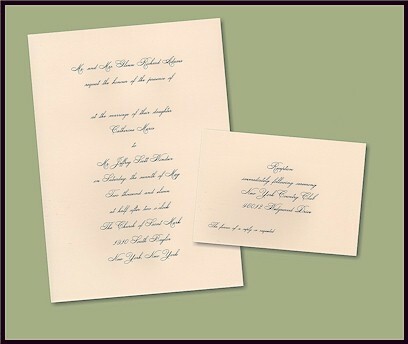 Although response cards used to be left blank for the invitees to formally respond with a short note, modern response cards are pre-formatted with spaces for guests to write in their names and/or check a box to accept or decline. Furthermore, many are designed as postcards to eliminate the need for extra envelopes. Providing a “Number of Guests Attending” blank will allow you to get an accurate head-count. Some brides and grooms worry that this option might give guests the impression that they can bring extra guests. To prevent this confusion, add a line that says, “We have reserved ___ seats in your name” and fill in the blank with the number of invitees. There is always confusion between honour and honor as well as favour and favor. Both are correct and a factor of personal opinion. 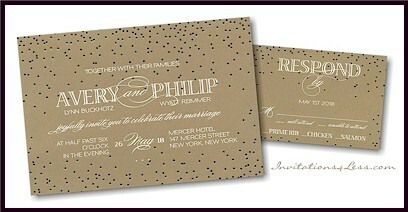 There is one rule, however: if you use “our” in your invitations, also use it in your RSVP cards (and vice versa). If you are having a seated dinner with a seating arrangement and meal selections, provide invitees with a meal selection center that allows them to choose which meal they prefer. Ask your guests to respond at least three weeks before the wedding date. Also don’t be afraid to get a little crafty with your language. Incorporating your wedding’s theme is a great way to set the tone and build up anticipation for the big day. If you’re fretting about the costs associated with RSVP cards and envelopes, consider creating a custom postcard that matches the rest of your invitation set. Postcards reduce clutter and make the RSVP process simple for both you and your guests. 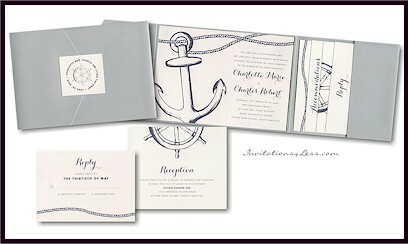 Invitations4Less has a wide-ranging selection of affordable and stylish wedding invitations. Browse our large selection or contact our custom invitation designer to transform your ideas into a custom invitation ensemble that will set the tone for your event and be a direct reflection of your personal style.